This year’s Consumer Electronics Show (CES) feels like the biggest ever with dozens of showcase venues, thousands of innovations and millions of products. It was a sprawling preview of the most exciting tech slated for release throughout the coming year. It’s an event too big for one convention centre and too diverse to gather up in a single piece. For all the attention garnered by 8K TVs, the show floors were packed with more Internet of Things (IoT) gadgets than ever before. While the CES did produce a number of new smartphones, they weren’t the focus of this year’s event. Instead, we saw wearables, robots, notebooks and the usual array of smart accessories to make consumers life easier. It was an interesting mix of technology that saw companies continuing to push the boundaries of design. So let’s talk about the gadgets that stood out at CES. Among all the products we saw first-hand, here are the ones we either instantly wanted to take home, or couldn’t resist taking down. Samsung at their keynote unveiled big 8K TV’s, smart Refrigerator, Laptops and washing machines for the CES 2019. They even saved a surprise by announcing their four new robots that can monitor health and help people walk. Bixby which started as a smart assistant for phones, now it is evolving and supports more and more devices including speakers and robots. The company announced that Bixby intelligence will be integrated into its 2019 premium TV segment and smart appliances like refrigerators, washers, as well as AI speakers and more. Samsung also announced its core AI philosophy: Fairness, Accountability, and Transparency. Samsung also committed to ensure the algorithms are inclusive and privacy are top priorities making it easy for consumers to understand what the company does with their data and how it is handled. Samsung unveiled its 98-inch QLED 8K to its 2019 line-up that includes 65-inch, 75-inch, 82-inch and 85-inch models. These Tv’s are powered by Quantum Processor 8K chip to deliver best picture quality, design, smart features in stunning 8K resolution. Samsung’s proprietary AI-based technology will ensure that the content streamed from any service should look pristine 8K quality. With an improved AI algorithm, the universal guide makes it easier for users to find the exact content user want to watch with just a voice by using new Bixby and the AI Remote. There are even more ways to control their Samsung TVs through Amazon Echo and Google Home. The biggest surprise from Samsung was the announcement of Apple services like iTunes Movies and Apple AirPlay 2 to support on 2019 Samsung Smart TV models. Support on 2018 Samsung Smart TVs will be made available via a firmware update. AirPlay 2 support will be available on Samsung Smart TVs in 190 countries worldwide. Samsung revealed a new line of laptops that combines productivity and flexibility to help consumers get things done more conveniently. The Notebook 9 Pro is an on-the-go modern professionals laptop that helps users to reach their true creative potential, while the Notebook Odyssey gaming laptop is powered by the new high-end NVIDIA GeForce RTX 20-series GPU making it ready for both work and play. Samsung Space Monitor has a sleek design and functionality. It is a minimalist, fully-integrated clamp stands that grips to the desk, tilting back and forth to free up space for optimal user productivity. Beyond aesthetics, Samsung’s Space Monitor is a feature-rich, high-performance monitor. The 27-inch model offers QHD resolution for incredibly detailed, sharp images, while the 32-inch model presents content in 4K UHD. In a surprise move, before the end of the keynote, Samsung unveiled four robots to help with various tasks. One of them was on stage, the Samsung Bot Care which demonstrates its health-tracking capabilities. The bot talked to Samsung executives, instructing them on what to do to measure their vitals. Samsung’s Lee placed his finger on the robot’s screen to take his blood pressure. Samsung also offered a glimpse to the future of Connected Living by demonstrating its latest developments in robotics platforms including the Samsung Bot Care, Samsung Bot Air, Samsung Bot Retail, and Samsung GEMS. Sony first launched the Master Series range last year for its high-end home TVs, and this year Sony’s Z9G 8K LED TV will flagship television for high-end home televisions. It is an 85-inch monster with 8K resolution and Sony’s latest X1 Ultimate processor. At the keynote, Sony’s executives talked most about their success stories and projects, including Spider-Man: Into the Spider-Verse. Sony unveiled its first 8K TV in 85-inches and a whopping 98-inches. The new 8K resolution TV promises improved detail compared to standard 4K. While there is no proper 8K content available, Sony ’s video processing can take 4K and lower-resolution video and converts it to 8K for display. These new 8K TV also have full-spec HDMI 2.1 inputs complete with 48Gbps capability, which means they’re compatible with higher frame rates and resolutions. Sony also revamped the sound quality, using four front-facing speakers to position the sound on the screen. Similar to Samsung, Sony’s 2019 TVs will work with Apple AirPlay 2. Sony has once again refreshed its line of Extra Bass portable Bluetooth speakers with several new models, including a speaker that can hold your glasses filled with beverages. 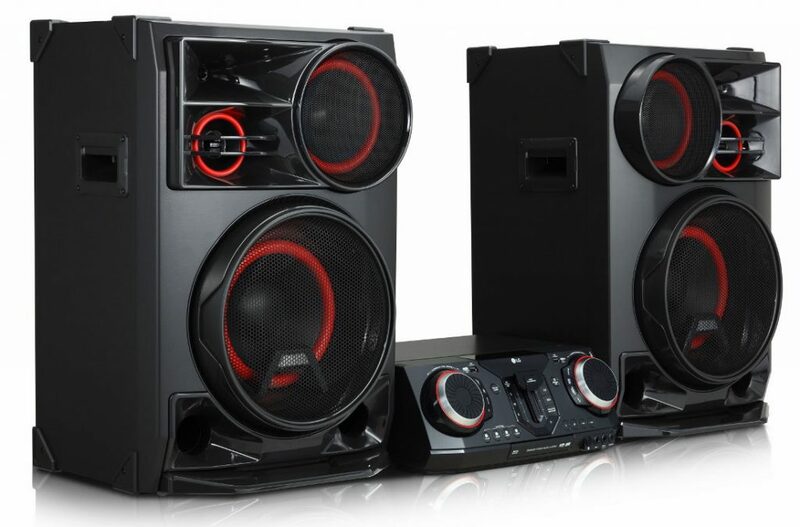 There is an entry level speaker – SRS-XB12 which is a micro Bluetooth speaker that has an integrated strap, while the SRS-XB22 and SRS-XB32 models have integrated lights for a light show. The XB32 delivers an impressive 24 hours of battery life and all three speakers feature IP67 water and shock resistance. Sony is one of the only manufacturers still launching high-end 4K Blu Ray players. The new X800M2 supports 4K Ultra HD playback, HDR10, Dolby Vision and Hybrid Log Gamma (HLG) in addition to 4K upscaling. The Sony will also support 4K streaming services such as Netflix and YouTube. Intel at CES 2019 keynote, announced the first 10nm Ice Lake processors based on its Sunny Cove architecture and even showing the chip powering a running laptop. Ice Lake integrated mobile solutions will arrive this year with the integration of Intel’s Gen 11 graphics providing significant performance uplifts. Other features include the new Wi-Fi 6 support (802.11ax) and fully integrated Thunderbolt 3 controller support, and Intel’s new instructions for AI processing, dubbed DLBoost. The new chips aim to improve modern PC performance, while Intel’s new Project Athena initiative hopes to push mobile computing to the next era with thinner and lighter hardware. Intel also announced six more 9th-gen processors, ranging from Core i3 to Core i9. According to leaked sources, the company may be launching these processors without integrated graphics chip to lower the cost of the processor. NVIDIA at CES 2019 keynote shared a glimpse of technologies that will enable the next generation of gaming. Nvidia talked about real-time ray tracing, a technology that was introduced late last year as part of the launch of the flagship GeForce RTX 2080 Ti graphics card, to deliver realistic visuals in games, but at CES, it talked about how it is improving frame rates when RTX is enabled by using artificial intelligence. Even they revealed its GeForce RTX Mobility graphics cards with the RTX 2080 and other cards, now available for gaming laptops. Nvidia also announced a new initiative that will have the company testing and certifying existing A-Sync monitors available in the market. Adaptive-Sync or A-Sync displays that pass Nvidia’s testing will become certified. It means a lot of monitors will support G-sync to provide much smoother gaming graphics without investing in G-sync monitors. LG spent a bulk of its presentation talking about artificial intelligence integrated to their products. There was also a TV-related announcement including the impressive rollable TV. There are a host of new partnerships with other manufacturers, with Apple Airplay 2 support and a dedicated iTunes movies app coming to LG’s ThinQ smart TVs this year. LG is also combining support for Amazon Alexa and Google Assistant, giving more choice than ever with TV voice controls. The main highlight of LG’s conference has to be its rollable OLED TV, now named as the LG Signature Series OLED TV R. It got a unique mechanical design, certainly won’t be cheap. The base doubles as a soundbar, meaning the television has a minimal presence in the room when not in use. It can be placed in front of a window or bookshelf. There are three modes of use — Full View, Line View and Zero View. In Zero View, the screen is completely hidden but users can play audio content through the soundbar, which is crafted in brushed aluminium with Kvadrat fabric. Line View is a part-way option where only the top part of the screen is unrolled to display content such as a clock, photos or a home dashboard. The TV is powered by second generation Alpha 9 processor and the company claims there is no loss of picture quality with the roll-up screen. LG is growing its XBOOM wireless speaker family. Among the new models for 2019, the XBOOM OL100 speaker delivers an impressive 2,000-watt output, with a ‘Blast Horn’ developed to improve high-frequency and bass performance. There’s a Meridian Mode, developed in collaboration with the British hi-fi company Meridian Audio, aptX HD connectivity with a multi-room link function. The world’s first working foldable phone has been unveiled by Royale. Royole beat Samsung by demonstrating their working Royole FlexPai at CES. It features a 7.8-inch AMOLED screen that folds in half. The ‘developer’ version of the handset is already on sale with a price tag of $1,318 (around Rs. 1 Lakh), and we’re sure to see a lot more of this foldable tech in the coming year starting from Samsung. Asus has really pushed the boat out with the Mothership GZ700 gaming laptop. It comes in a massive tablet size form factor where the components are behind the laptop screen, rather than beneath the keyboard. Asus also announced its new ultra-thin ROG Zephyrus S GX70 gaming laptop, combining the power of its high-end RTX 2080 graphics card with a slim design allowing hardware manufacturers to design thin gaming laptops. Huawei showcased their new MateBook 13 which could be a MacBook Air killer. It’s a 13-inch Ultrabook features 8th-generation Whiskey Lake processor paired with 8GB of RAM and up to 512GB of M.2 storage. There is also a variant with Nvidia GeForce MX150 GPU. This all powers a 13.3-inch 2K (2,160 x 1,440 pixel) touch display. The bezels on the laptop only amount to 4.4mm in thickness and the display features a 100 percent sRGB colour gamut and 300 nits of brightness. Nubia is kickstarting 2019 by launching several new cutting-edge smartphones. The company has unveiled global the gaming phone – Red Magic Mars and Dual screen phone – nubia X at CES in Las Vegas. Inspired by Mars, the nubia’s powerful flagship gaming phone – RedMagic Mars, is powered by Qualcomm Snapdragon 845 and comes in three variants: 6+64, 8+128, 10+256 GB of RAM and storage, respectively. It also has industry-first, ICE multidimensional cooling system combines air cooling and liquid cooling. Convex-shaped back design increase air convection both inside and outside the phone. Additionally, a liquid-filled copper tube directs heat away from the CPU and GPU to boost performance. There is a touch-sensitive shoulder button to provide additional hardware buttons without the need for an external gamepad. The Mars also boasts an FHD+ 6-inch IPS LCD display and a 3,800 mAh battery. Users can also customize lighting effects on the rear-facing LED RGB strip, which features 16.8 million colours. The unique, dual-screen nubia X features a bezel-less 6.26-inch display on the front of the device with no notch or camera cutout. This is made possible by adding a 5.1-inch display on the back of the device. Both are full-featured touchscreens on both sides of the device. With a display on the back of the device, users can take photos or video chat using the high-quality rear camera (24MP+16MP). In addition, the touch functions on both screens can be used simultaneously. Also, Nubia has included five layer blue-light-blocking glass on the rear screen, creating an ideal e-reader. Yeelight at CES unveiled Apple HomeKit compatible lighting products and a new BLE MESH lighting package. Yeelight products are compatible with Apple HomeKit which includes Mi Bedside Lamp 2, Mi Desk Lamp Pro and Mi LED Color Bulb. These products were launched into the market and support voice control with Siri, or the Apple Home app on iPhone, iPad, Apple Watch and Mac. Now Yeelight announced a commitment to support HomeKit in its own products including Yeelight Aurora light strip plus and Yeelight smart bulbs. HomeKit support for Yeelight products is expected to be available in the coming months. The BLE MESH lighting group by Yeelight includes the light bulbs, the candle bulbs, the downlights and the spotlights. Compared with the Wi-Fi bulbs, downlights and spotlights, the Yeelight BLE MESH lighting group provides an easier and more stable connection to the network. Instead of pairing your lights one by one to the network, the BLE MESH lights connects into the network by batches through the gateway. BLE MESH is actually more stable in connection compared with Wi-Fi. All the lights in Yeelight BLE MESH lighting group are dimmable and support adjustment of col.
Garmin announced its first LTE-enabled smartwatch by partnering with the US-based telecom operator Verizon Wireless. The Garmin Vivoactive 3 Music is the first LTE-enabled smartwatch from Garmin. Including LTE support, you can listen to music on the Garmin Vivoactive 3 Music via Bluetooth headphones. You can also make and receive phone calls, send and receive text messages and track all of your workouts. The Garmin Vivoactive 3 Music has three variants — LTE (with music), Music (without LTE), and a standard one (without LTE or music). The Garmin Vivoactive 3 Music LTE lets you store up to 500 songs, but no words on the storage size. The watch can track workouts which include running, swimming, strength training and more. You can even measure your VO2 max levels and battery life of up to seven days in smartwatch mode, 13 hours on GPS mode, five hours on GPS with music. Audio-Technica introduced company’s most advanced wireless noise-cancelling headphones – ATH-ANC900BT to combine digital hybrid noise-cancelling technology with powerful audio performance. Audio-Technica also introduces two more affordable wireless noise-cancelling models, the over-ear ATH-ANC500BT and the in-ear ATH-ANC100BT. The ATH-ANC900BT are equipped with multiple microphones that monitor the surrounding environment and deliver accurate noise cancellation. There is an option to choose from three noise-cancelling modes, including the aeroplane mode. Alternatively, the intensity of the noise cancelling can be controlled or customized using the free Audio-Technica Connect app for iOS and Android. The headphone feature the latest low-energy Bluetooth 5.0 wireless standard, which provides up to 35 hours of audio in both wireless and noise-cancelling modes from a single charge. Dell has announced a slew of product refreshes at this year’s CES in Las Vegas. The biggest new addition to the company’s main line of work PCs this year is the Latitude 7400 2-in-1. Dell also launches G7 and G5 gaming laptops with NVIDIA GeForce RTX Graphics along with 8th gen Intel CPUs. Dell Latitude 7400 is the world’s smallest commercial 14-inch 2-in-1 laptop. The coolest thing about this new laptop is that it’s the first to feature a proximity sensor (powered by Intel Context Sensing Technology), utilizing a feature called ExpressSign-In to notice a user’s presence and wake up the system to initiate a Windows Hello facial recognition. In addition to Windows Hello, it features other authentication options, including a touch fingerprint reader, and a contacted and contactless smart card reader. It can lock itself for security and save battery life. The laptop features the newest Intel 8th Gen Core processors. Additionally, it boasts up to 24 hours of battery life with Super Low Power Panel and ExpressCharge technology. The Dell XPS 13 has an updated with the latest quad-core 8th Gen Intel Core processors. Besides that, you can get up a 4K display, surrounded by a slim 4mm bezel, and Dolby Vision support for HDR video. Finally, Dell has moved webcam design right where it belongs — above the screen. Though it does not have a Windows Hello camera, there’s an optional fingerprint reader for biometric logins. Dell also announced 13-inch and 15-inch Inspiron 7000 2-in-1 devices. The most noteworthy design is the method of storing Active Pen accessible within the hinge. There is a new keyboard, that sports an all-in-one power button/fingerprint reader power key. The 15-inch model able to squeeze a number pad. Another feature that Dell highlights is the device’s Adaptive Thermal technology, which it says allows the 2-in-1 to adjust its performance based on how it is being held. The refreshed G-series gaming laptops can be configured with 8th Gen quad-core hexa-core Intel processor along with NVIDIA GeForce RTX 20 series gaming GPU while making them sleeker at the same time. In addition to the upgrades in the processing and graphics department, other notable features are the 4-zone RGB keyboard with customizable backlighting. It also comes with Alienware Command Center and G-Sync panels with up to 144Hz refresh rate.